Christmas 1940. Photo from Corrine Knowles. 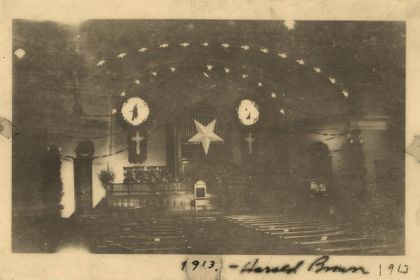 Written on the back of this photo is "Christmas Decorations, Harold Brown Sunday School Class." This photo is not dated. Approximately 1937. The painting is by Lester Allen. 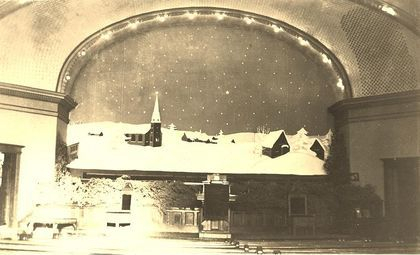 1948 Max Bernd-Cohen mural in the sanctuary of the church at Eighth and Main Streets in Cañon City, Colorado. The following photos are not dated. They show a portion of the Max Bernd-Cohen mural in the First Methodist Church sanctuary. Taken from A History of First United Methodist Church of Cañon City, Colorado From Its Founding in 1866. "The mural was painted by Max Bernd-Cohen who was the director of the Royal Gorge Art School in Cañon City and a graduate of the Columbia University School of Art. It contained a central panel titled "The Sermon on the Mount" and accompanying side panels titled "The Good Samaritan" and "Christopher Carrying the Christ Child". 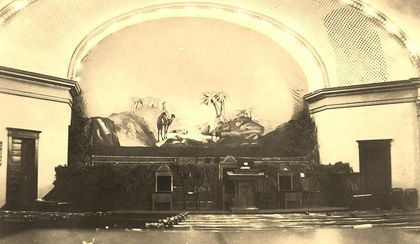 The mural, like many pieces of art, was controversial in that its style was not universally appreciated. Nevertheless it remained a central focus of the sanctuary for the next eleven years. 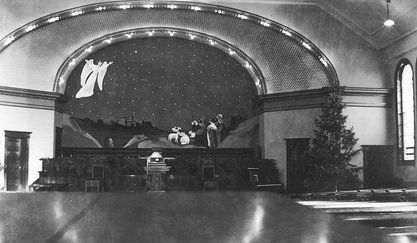 By a vote of the Official Board it was decided in January of 1959 to remove the mural from the sanctuary and offer it to other interested churches." See the Mural Dedication Program to learn more.